This is a review of the product BioHair Capsules. The manufacturer of this product claims that it can prevent hair loss by targeting a hair growth killing hormone known as DHT and can supply the necessary nutrients to your hair follicles and initiate the process of regrowth. Read on to learn more about the ingredients of this product as well as our opinion of whether it is the right product to take for your hair. Other ingredients include MSM (Methyl Sulfonyl Methane), Gelatin, Horsetail, Inositol, Grape Seed, Flax Seed Oil, Brown Seaweed, Ginkgo Biloba, L-Alanine, L-Arginine, L-Aspartic Acid, L-Cysteine, L-Glycine, L-Histadine HCL, L-Isoleucine, L-Leucine, L-Lysine, L-Phenylalanine, L-Proline, L-Serine, Taurine, L-Threonine, L-Valine, Hydroxypropyl Methyl Cellulose, Silica and Magnesium Stearate. It is recommended that adults take two capsules of this product daily, preferably with a meal. There are no prominent side effects of this product as it has been formulated with the help of natural ingredients like vitamins, biotin and minerals. However, you may experience an upset stomach if you don’t take this capsule with a meal. In case of an allergic reaction to any of the ingredient in the product, you should contact a doctor immediately. The price of this product is listed as $39.99 on the company’s website and includes 60 vegetable capsules which are enough to last a full month. The manufacturer also offers a discount of $19.98, if you order 3 bottles of this product. The manufacturer of this product does offers a hundred percent money back guarantee and states that if you are not satisfied with the product and if it doesn’t display the desired results then you can return it without any hassle. However, the manufacturer hasn’t specified the terms of the guarantee and how many days you have to return it after purchase and what condition the item needs to be in. There are only a few reviews of this product on the company’s website which are positive. 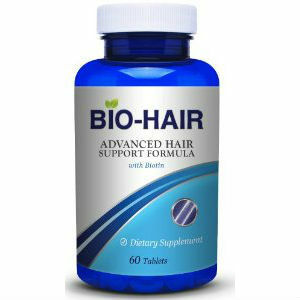 BioHair Capsules are formulated by the combination of organic and natural ingredients and it contains active nutrients that are delivered to the root of your hair through the blood stream and as a result it can provide nourishment to your hair from the inside. The manufacturer of this product claims that it can promote healthy, thick, full and lustrous hair. However, the ingredients of this product also include gelatin which makes it unsuitable for vegetarians and vegans. In addition to this the terms of the money back guarantee and return are also not clear and there are only a few reviews of this product on the company’s website. The bottom line is that it may not be the best product for you. John Brownstone	reviewed BioHair	on July 29th	 and gave it a rating of 3.